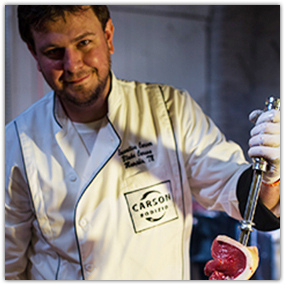 If Blake Carson has his way (make that when, not if), picanha—spit-roasted beef top sirloin, crusted with coarse salt and cooked over live fire—will become a household word in the U.S. The Memphis, Tennessee, native is evangelical when it comes to Brazilian barbecue. In fact, a lot of words beginning with the letter “e” apply to Blake. Enthusiastic. Entrepreneurial. Exuberant. Particularly when he talks about his from-scratch invention, the Carson Rodizio. He’s ingeniously designed it to fit on most grills—charcoal, gas, kamado-style grills, etc. I first encountered Blake when he sent one of his innovative rotisseries to Barbecue University. Attendees were amazed when they realized they could replicate the Brazilian steakhouse (called a rodizio) experience at home. They wasted no time spinning a dazzling array of meats and vegetables on rapier-sharp spits over a charcoal fire. At least one student placed an online order for a Carson Rodizio even before lunch was served. Though he’s only 33, Blake’s been preaching the gospel of Brazilian barbecue (called churrasco in Portuguese) for nearly 20 years. He was a soccer prodigy as a young teen and spent a summer training with a pro team in Rio de Janeiro. He was so enamored of the country’s grilling culture that he vowed to someday import it to Memphis—a town that knows a thing or two about barbecue—and ultimately, the world. In college, the enterprising Blake furthered his dream and developed his catering chops by working as a passadore (meat waiter) at a Brazilian steakhouse. 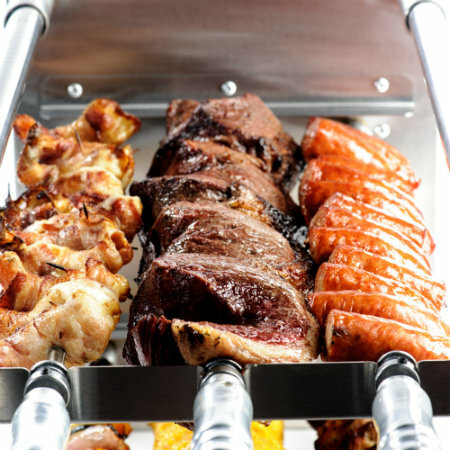 He became skilled at not only carving a variety of meats off skewers directly to patrons’ plates, rodizio-style, but at grilling the meats to order, including beef—especially picanha—pork, chicken, fish, and lamb. Crowdfunding sponsored the manufacture and delivery of the first Carson Rodizios to the U.S. (They’re made in Brazil.) Recently, he initiated a second campaign to build and sell 2-foot by 5-foot self-contained outdoor kitchens for home cooks who consider barbecue a lifestyle, not a hobby. (Read about it here.) With one of these babies, you could grill picanha for 100 of your closest friends and warehouse 433 icy-cold beers. For a recipe for authentic spit-roasted Brazilian Picanha with Country Salsa, click here. And for dessert? I recommend dramatic-looking Spit-Roasted Pineapple from Planet Barbecue, crusted with sugar, cinnamon, and cloves, and carved (just like picanha) directly onto plates from the spit and topped with whipped cream or vanilla ice cream (extra points if they’re smoked). 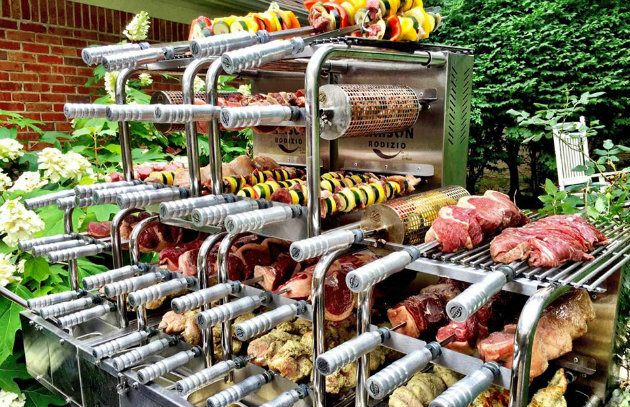 Convert your grill into a Brazilian-style rotisserie with the Carson Rodizio Kit.